After much speculation about who would be following Marty Quinn into the Showgrounds hot seat, the Management Committee didn’t have to look too far when making their appointment. David Platt had spent the previous two seasons as Quinn’s assistant and was well respected by the players. Another member of the famous Platt footballing dynasty, David had been a goalkeeper for Coleraine in the early 1990’s, becoming the first third-generation player in the club’s history (following in the footsteps of his grandfather Howard and father Davy) and had spells at several other north west sides before injury brought his career to a premature end. He then worked his way up through the coaching ranks at the club and now followed in the footsteps of his uncle Jim, by being handed the manager’s job. His first season began well, with Coleraine playing a more attractive style of football and, with new signings, including Richard Gibson and Gareth Harkin, gelling well with the established players; Coleraine went top of the Premiership table after six games. The early form couldn’t be maintained however, and a bad run of form in November and December tempered the early optimism. 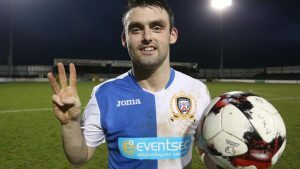 Dipping into the transfer market in January, Platt brought Darren Boyce back to Coleraine after an unhappy year at Glentoran and he scored a hat-trick on his return in a 4-0 win at Newry, which ended a ten match winless streak. Coleraine were knocked out of the Irish Cup after a controversial tie against Glentoran at The Oval, but returned to East Belfast the following week and shocked the eventual champions with a 3-1 win, with goals from Carson, Gibson and Crossan. Six days later, they defied the odds again and won 1-0 against Linfield at Windsor Park. 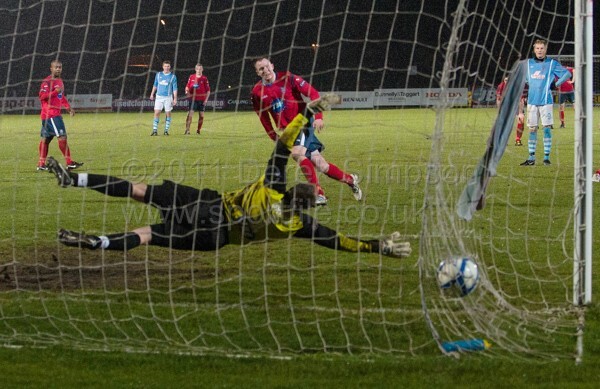 Gareth Tommons, signed from Limavady in January, scored the decisive goal, while Davy O’Hare saved a last-minute penalty to preserve Coleraine’s advantage. These results effectively booked Coleraine’s place in the top six split and they eventually finished fifth, a promising start from the new regime. Another fillip for the club was the inclusion of Stephen Carson in the Northern Ireland squad for a friendly in Italy during the summer. Carson started against the world champions and performed credibly against a team which included many top Serie A players. Aiming to build on that success, Platt was busy in the transfer market during the summer of 2009. Michael Hegarty, Aaron Canning and Marc Mukendi all brought different attributes to the squad, but the most intriguing signing was Rory Patterson. A prolific goalscorer in non-league football in England, but nonetheless an unknown quantity in the Irish League, Patterson wasted no time in making an impression, scoring on his debut against Linfield and then hitting a hat-trick in a 3-2 win over Ballymena United. Despite the late-August addition of former Everton youth player Eunan O’Kane, Coleraine were inconsistent throughout September and October, only recovering after a rather fortuitous North West Cup final win over Limavady United. Wins over Dungannon and Crusaders got them back on track in the league, but it was another visit to The Oval which would provide a season-defining moment. Coleraine tore the defending champions apart with a superb display of attacking football. Boyce opened the scoring against his former club, but then Patterson took over with four goals displaying the full range of his talents, before Carson put the cap on an astonishing 6-0 scoreline, Coleraine’s biggest ever victory at the East Belfast venue. Then a week after events at The Oval, Coleraine hosted a live Sky Sports match for the first time and Patterson and O’Kane (2) scored as Glenavon, managed by old favourite Marty Quinn, were swept aside. 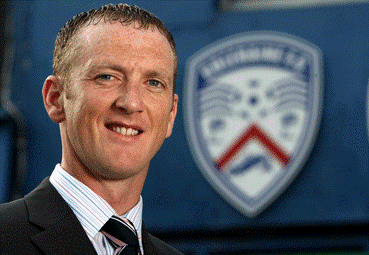 Bad weather at the end of 2009 hurt Coleraine’s momentum and by the time league action resumed, the club had been rocked by the news that Patterson had signed a pre-contract with Glentoran. He kept scoring however, netting four again as Coleraine defeated Crusaders 5-2 and then a hat-trick against, irony of all ironies, Glentoran, in a 4-3 win for Coleraine, but his relationship with the supporters was never the same again. 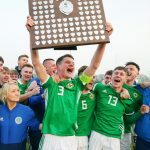 Patterson was also instrumental in wins at Windsor Park and Solitude and he earned a Northern Ireland cap in a friendly against Albania at the start of March, but by that time Coleraine’s season had begun to unravel. Sitting on the fringes of the title race at the end of February, a winless March left them with a fight to even make a top six place. This bad run meant that they headed into the Co-Operative Insurance Cup final against Glentoran in poor form. On the way to the final they had overcome Lisburn Distillery and Cliftonville over two legs, before defeating Dungannon in the semi-final at The Oval, but their earlier momentum had all but disappeared by the time they took on the Glens in the Windsor Park showpiece. But Coleraine lifted themselves after falling behind in the first half and with teenage winger Stephen Dooley a constant threat, soon turned the score around, with Boyce and Patterson hitting the target. A defensive lapse on the stroke of half time gifted Glentoran an equaliser and after the enforced substitution of Dooley in the second half, Coleraine lost their way. 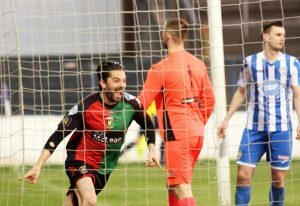 The game went down to a penalty shootout and while Glentoran scored all four of their kicks, Aaron Canning and Boyce missed, and Coleraine suffered a heart-breaking defeat. A week later, they drew against Portadown to miss out on a top six finish and a fortnight after that, hopes of glory in the Irish Cup also faded as despite leading 2-1 going into the final ten minutes, an injury-hit side conceded three late goals against Linfield. Given that the team were the second-highest scorers in the league and boasted the top two goal scorers in Patterson and Boyce, seventh place represented a major underachievement. But with Patterson gone, how could Coleraine replace his 41 goals the following season? Initially, hopes were pinned on former Ipswich and Hibs striker Sammy Morrow, who had joined the club in February, but he left for Tranmere after only playing two games of the 2010/11 season. Coleraine had signed a number of big names during the summer, including David Scullion and Aaron Black, but the start to the season was a complete nightmare. The first six games brought six defeats and not a single goal scored, but the duck was finally broken in a North West Cup win over Limavady, before two goals from another new signing, defender David Ogilby, helped kick-start the league campaign with a 4-0 win over Donegal Celtic. Although results picked up, goals were still hard to come by and in an attempt to remedy this, Platt pulled off a major coup by attracting one-time Chelsea trainee Leon Knight to the club. Knight made an instant impact by scoring twice on his debut against Glenavon and continued to impress until an injury ruled him out and then another severely cold winter put the season on hold over Christmas. Coleraine started 2011 well, with wins over Cliftonville and Glentoran but this was followed by a number of poor performances and after back to back defeats against Dungannon Swifts that saw Coleraine slump to tenth in the table, Platt was sacked by the club’s Board at the beginning of February. The club didn’t waste any time in appointing a successor, with Limavady United manager Oran Kearney being appointed a mere two days after Platt was dismissed. 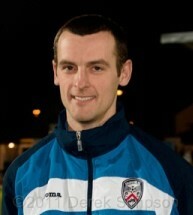 Kearney had trained with Coleraine for a period in the mid-1990’s before going to University in Liverpool. On his return he had played for Moyola Park and Ballymena under his father-in-law to be, Kenny Shiels, before joining Linfield, where he was a key member of the side which won the domestic clean sweep and three successive league and cup doubles. Injury saw him prematurely call time on his career in 2009 and he had made an impressive start to his career in management at Limavady. Coming with him was his assistant from Limavady, Trevor McKendry, who returned to the club after a spell as a player in the late 80’s and early 90’s. Kearney’s debut on the bench came in a derby at Ballymena and, despite just one training session with the team, he got a battling performance from them and a 1-0 victory, Kyle McVey tucking away a late penalty to win the match. An impressive unbeaten run followed, with Coleraine pulling themselves away from trouble at the bottom and into contention for the top six again. There was another memorable win over Linfield at Windsor Park, although a defeat to Crusaders at the end of March meant they would finish another season in the bottom half of the table. There was disappointment also in the Irish Cup as Coleraine lost out on penalties to Glentoran after an action-packed quarter-final replay at The Showgrounds, but the season finished with four successive wins, meaning the highest possible finish of seventh was achieved. 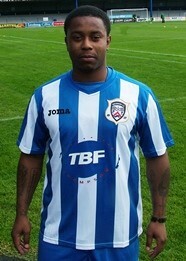 Curtis Allen joined the club from Linfield in May 2011. A number of long-serving players, including Carson and O’Hare left the club during the summer, but Kearney was busy in the transfer market, bringing no fewer than 13 players in his first transfer window at the club, the most significant being former Linfield frontman Curtis Allen, left back Johnny Black, formerly of Glentoran and Michael Doherty, who had worked with Kearney at Limavady and would replace O’Hare as number one goalkeeper. Wes Gregg was also added to the coaching staff. With so many changes in the playing staff, it was perhaps understandable that it took this new-look Coleraine a while to find their feet. They began the season with four draws and a defeat, before finally winning at the sixth attempt, an epic see-saw encounter against Portadown. Stephen Lowry scored a dramatic late winner, but it was Johnny Black who grabbed all the headlines, netting his first goal for the club with an audacious free kick from inside his own half, catching hapless Ports ‘keeper David Miskelly totally unawares. 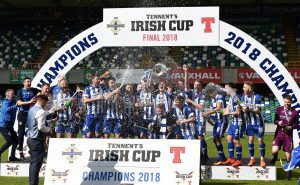 Coleraine steadily climbed the table in the weeks that followed, but some of the best performances were reserved for the newly re-branded IRN BRU League Cup. 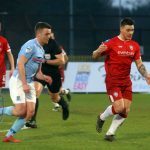 After overcoming potential banana skins against Knockbreda and Newry City in the early rounds, the Quarter Final draw pitted them against Glentoran. Despite falling behind, Coleraine rallied in the second half, goals from Black and a towering header from skipper David Ogilby turned the game on its head, before Michael Doherty made himself a hero with a last-minute penalty save. The semi-final against Cliftonville was another epic affair, eventually settled by another wonderful goal from Black, this time in the dying moments of extra time at Solitude. David Ogilby celebrates after netting in the Irn-Bru League Cup quarter-final against Glentoran at The Oval. Coleraine entered the February showpiece against Crusaders in excellent form, on an unbeaten run which stretched back to November and with a large support willing them on. Indeed such was the demand for tickets for the final at the Ballymena Showgrounds, that the club’s sponsors ended up paying for a temporary stand to be erected behind one of the goals. But on the day the occasion proved too big for them. Crusaders’ Chris Morrow scored in the first half and the North Belfast side shut the game down, never allowing Coleraine a chance of getting back into it. Stephen Baxter’s side truly were Coleraine bête noir that season, eliminating the Bannsiders from the Irish Cup at the quarter final stage and then, on the final day of the season, knowing a win would seal a much-coveted return to European competition and the financial bonus that came with it, Coleraine couldn’t overcome a much-changed Crusaders team which had one eye on upcoming Irish Cup and Setanta Cup finals. It had been an impressive first full season for Kearney, yet one that was full of what might have beens. 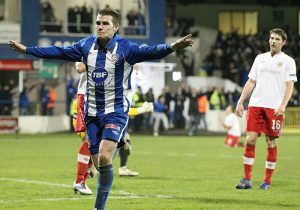 Coleraine started the 2012/13 season with serious ambitions of going one step further than the previous campaign. With summer reinforcements including highly-rated left back Lee Colligan and the surprise third coming of striker Darren Boyce, Coleraine started brightly. The early highlight of the season was an unbelievable comeback away to Portadown, where after 70 minutes the Bannsiders found themselves completely outplayed and 3-0 down. Boyce and Aaron Canning gave them a glimmer of hope before Curtis Allen equalised with two minutes left, then with virtually the last kick of the game, sub Mark Gillan headed home a scarcely believable winner. Another early season highlight was the home game against Linfield which was televised live by Sky Sports. After Boyce and Allen had fired Coleraine into a 2-0 lead, Linfield battled back to level it, before Stephen Lowry won it late on with a wonderful strike in front of a packed Railway End. 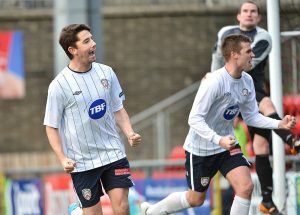 Stephen Lowry celebrates after netting the winner against Linfield on Sky Sports. That was about as good as it got for Coleraine though. As autumn turned into winter injuries to key players took their toll and a run of draws saw them slip out of the pack of teams challenging at the top of a now much more competitive Premiership. The defensive solidity which had been the cornerstone of the previous season’s success had deserted them with a worrying number of heavy defeats early in the new year before the league campaign petered out with a sixth place finish. There wasn’t even a serious tilt at one of the cups to redeem the season, Linfield had ended hopes of another League Cup run in the last 16 and Portadown dished out a humbling defeat in the last eight of the Irish Cup. A return to the Setanta Cup had briefly offered hope of glory, David Scullion’s goal sealing a 1-0 win over Shamrock Rovers in Dublin, before a 2-0 defeat at home saw the Bannsiders knocked out. The summer of 2013 brought more changes. 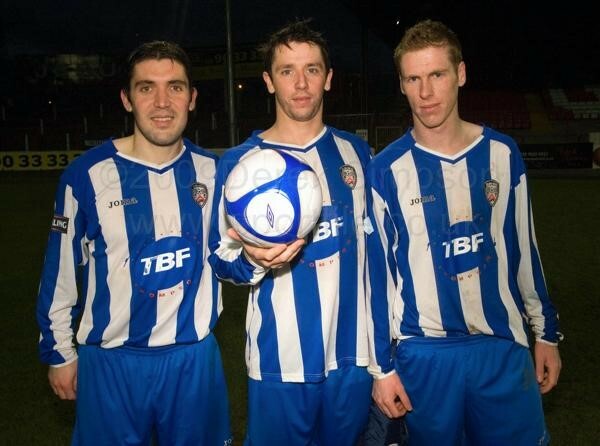 Out went Scullion, Doherty, Kyle McVey and Allen, who after becoming the first Coleraine player since Ray McCoy in the 1980’s to score 20 goals in successive seasons, departed for a brief stint in full time football in Scotland. In came Oran Kearney’s former teammate at Linfield Steven Douglas, goalkeeper Wayne Drummond, forwards Gary Browne and Eoin Bradley and surprisingly, Stephen Carson! 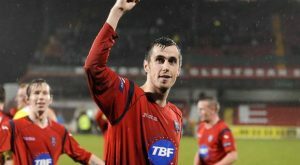 Yes, after two years away, including an Irish Cup win the previous May with Glentoran, Carson returned to his boyhood club for what would prove to be the final few months of his playing career. But the new season brought another inconsistent start, which soon turned into a nightmare run as in the run up to Christmas saw Coleraine stuck at the wrong end of the table. More signings arrived in January in the shape of ex-Derry City duo Davy McDaid and Eugene Ferry and a brief return for Stephen Dooley, who scored twice in two games, one of which was an Irish Cup tie away at Cliftonville which saw Carson make his final appearance before departing for a new career coaching in the USA. 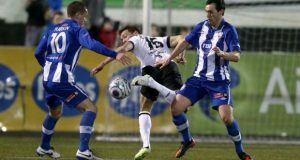 Ruairi Harkin and Michael Hegarty in action as Coleraine sealed an impressive 3-2 win against Dundalk at Oriel Park in 2014. Despite another excellent away performance in the Setanta Cup, this time a 3-2 win at Dundalk, it was on the whole a season to forget, with Coleraine missing the top six and eventually needing a win away to Warrenpoint in the final week of the season to put themselves clear of the ignominy of a relegation play-off. The following season was significant in some ways, as it was the first time the names of Lyndon Kane, Brad Lyons and Jamie McGonigle would feature regularly on the team sheet, having impressed for the Reserves. Darren McCauley, back after a couple of seasons at Institute, and Ian Parkhill, brought in from local junior football, also became established as key members of the squad. But in terms of performances on the pitch, it was little better, as they missed out on the top six again after a slump in form after Christmas and bowed out of the Irish Cup at the first hurdle with a feeble performance at home to Warrenpoint. Struggles on the pitch however, were put sharply into perspective in the close season, as the whole club mourned the sudden death of Wes Gregg. He had only just announced he would be stepping down as a member of the coaching staff and his death came as a massive shock and greatly affected all those who had known him. The 2015/16 season saw a major change in the Irish League. 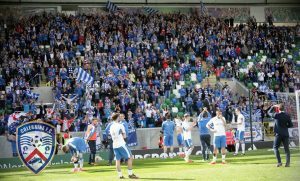 For the first time the final European qualification space would be decided by a play-off system, adding an extra incentive for Coleraine to make the top six. In a relatively quiet summer in the transfer market, the most intriguing arrival was James McLaughlin, who arrived with a prolific goalscoring record in junior football and would eventually finish the season as top scorer. Another significant arrival came in January, with an injury to Doherty seeing Bangor goalkeeper Chris Johns brought in and quickly made the number one jersey his own. In a season of ups and downs, Coleraine eventually finished fifth, but lost at home to Glentoran in the new European play-offs. There was also disappointment in the cups, an early exit to Portadown in the Irish Cup and despite having led 2-0, a penalty shootout defeat by Championship side Ards in the League Cup. Heartbreak for Coleraine as old boy Curtis Allen scored in the European play-off defeat. Initially the omens for the 2016/17 season weren’t good. Club captain Howard Beverland had departed in the summer and the league season started with farce as Coleraine found themselves without opposition on the opening day as Portadown were suspended by the IFA for non-payment of a fine. The first half of the season was marked by more inconsistency, but a low point was reached in December, with an injury-ravaged side going down to two derby defeats first in the League Cup semi-final and then in the league on Boxing Day. Eoin Bradley re-joined the club in January 2017 and blasted in a hat-trick against Carrick Rangers. However, a win over Carrick on New Year’s Eve kicked off an amazing run of form and with the January additions of Ciaron Harkin from Institute and Eoin Bradley, back after two and a half seasons at Glenavon, Coleraine were transformed. They went on a 17 game unbeaten run which took them from the bottom six to third place and an Irish Cup Final. 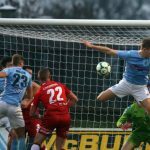 The Irish Cup run brought particular joy in two ties at Ballymena, the first a 4-0 quarter-final win over their derby rivals where Bradley and Jamie McGonigle ran riot, scoring two goals apiece. The second was the semi final, where James McLaughlin’s last-minute header secured a 2-1 win over cup holders Glenavon and a return to the final for the first time in nine years. Coleraine supporters applaud the players after the Irish Cup final defeat to Linfield. Their opponents there, once again, would be Linfield, who came into the showpiece on the crest of a wave having just won their first league title in five years, where one of the key results for them had been a 5-1 win at The Showgrounds a fortnight before the final. Despite that setback, Coleraine had performed well in their previous encounters and were actually the last team to have defeated Linfield, back in January. But on the day of the final, they just didn’t turn up and Andy Waterworth’s hat-trick won the cup and the double for the Blues. The consolation for the Bannsiders was that their third place finish, combined with the cup final appearance had ensured a return to Europe in the Europa League that summer. Coleraine’s European return lasted only one round, the Bannsiders having the misfortune of drawing Norwegian full-timers FK Haugesund and then travelling to face them without a number of regulars, including goalkeeper Chris Johns. The 7-0 defeat was followed by a much more credible performance at home, which brought a 0-0 draw. 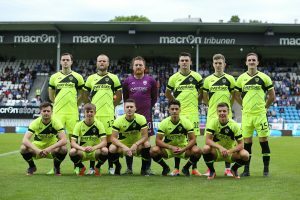 Coleraine made a return to European competition as they faced FK Haugesund from Norway. The squad, strengthened in the summer with the notable additions of former NI international winger Josh Carson, defensive duo Stephen O’Donnell and Aaron Traynor, was stretched to its limits in the opening weeks of the domestic campaign as Lyndon Kane and James McLaughlin were ruled out through long-term injuries, the latter for the whole season. The first game of the domestic season seemed to indicate Coleraine had a long way to go to be considered genuine contenders. As Irish Cup runners-up Coleraine contested the Charity Shield against Linfield and although Josh Carson put the Bannsiders ahead against his old employers, the Blues’ superior strength in depth saw them take total control of the game after the break and ease to a 3-1 win. Did it cross the line? Coleraine players celebrate Jamie McGonigle’s last gasp effort against Linfield. But Coleraine responded with a record-breaking start to the league campaign. Seven consecutive wins, including defeats of both Cliftonville and Crusaders inside a week and a 4-2 thriller against Glenavon. The run came to an end in the eighth game, a 0-0 draw at The Oval, where they played with ten men for most of the game and escaped with a point after a late penalty miss from Glentoran. Three weeks later, they hosted Linfield and this time Coleraine were not overawed. Brad Lyons and Mark Haughey exchanged goals in the second half but then came one of the most controversial moments of the season. Jamie McGonigle beat Roy Carroll with his shot and as it appeared to cross the line, covering defender Josh Robinson came in to sweep the ball clear, but the goal stood, much to the fury of Linfield’s players. The unbeaten start lasted until the middle of November, stopping at 14 by, almost inevitably, Linfield, who won 2-1 at Windsor Park. However, that would be the last time the Bannsiders would taste defeat all season. They held top spot through December, before a couple of draws over Christmas, followed by the postponement of the New Year’s Day game against Linfield, saw Crusaders, on a phenomenal winning run of their own, climb into pole position. The two sides met in a thrilling encounter at The Showgrounds at the end of January, where Coleraine were first 2-0 and then 3-1 behind, before roaring back to level at 3-3 after the dismissal of Colin Coates, the goals coming from McGonigle, who got two, and Darren McCauley. 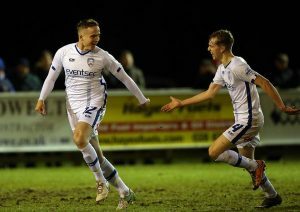 Aaron Burns signed a two-and-a-half-year deal at The Showgrounds in January 2018 and marked his debut with a goal against Ballinamallard United. But further home draws against Linfield and Glenavon looked to have put the breaks on the title challenge, but Kearney’s men dug deep and with the help of January reinforcements Aaron Burns and Stephen Dooley, the prodigal son back after helping Cork City to successive league and cup doubles in the League of Ireland, kept winning to keep the pressure on. By the time the split came, they were only two points behind, setting up a massive clash at Seaview at the beginning of April. McGonigle scored from the penalty spot to put Coleraine ahead, but David Cushley’s late equaliser kept the destiny of the Gibson Cup in the North Belfast side’s hands. The following Saturday, while Coleraine came from behind to beat Cliftonville, Crusaders could only draw at home to Glenavon. Now only goal difference separated the teams. It stayed that way until the final day, but Coleraine fell heartbreakingly short. A 0-0 draw at Mourneview Park brought the season to a close, but even a win wouldn’t have been enough as Crusaders got the win they required at Ballymena. But there was still plenty to play for as Coleraine looked forward to another Irish Cup Final. Comfortable wins over Lisburn Distillery and Institute in the early rounds set up a quarter final showdown with Glentoran, who were dispatched thanks to an excellent Darren McCauley strike. So it was on to another semi-final at the Ballymena Showgrounds against big-spending Championship outfit Larne, the very definition of a potential banana skin. But on the day, Coleraine’s big-game experience made the difference, Lyndon Kane opened the scoring with a wonderful strike and although ex-Coleraine forward Davy McDaid equalised, Gareth McConaghie’s header restored the lead before Josh Carson converted a late penalty to send Coleraine into the showpiece against Cliftonville. 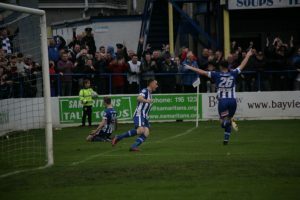 At the National Stadium, Coleraine weathered a strong start from their opponents and the blow of losing Dooley to injury early in the first half. Right at the start of the second half, Traynor picked out McCauley with a pinpoint cross and the winger opened the scoring with a trademark screamer, his 20th goal of the campaign. Although Rory Donnelly equalised for Cliftonville, the Bannsiders were not shaken and retook the lead with 12 minutes left. Chris Johns’ miss-hit free kick caught the Cliftonville defence flat-footed and with the slightest of touches from Eoin Bradley, Aaron Burns was clean through on goal and he made no mistake with his finish. Cliftonville threw everything at Coleraine in the final stages, but the defence marshalled by Man of the Match McConaghie and captain Stephen O’Donnell, stood firm, Adam Mullan made a superb tackle to deny Donnelly a clear shot at goal and Johns was untroubled. Then, in the final minute of injury time, Shane Grimes slipped, leaving Bradley with a clean run on goal, he cut inside and then chipped the ball over the advancing Brian Neeson to seal the win. Cue pandemonium among the Coleraine fans who occupied three sides of the National Stadium and on the pitch as Oran Kearney, the coaching staff and substitutes all joined the celebrations. Coleraine celebrate winning the Irish Cup after a 3-1 win against Cliftonville. Steven Douglas and O’Donnell lifted the cup together to cap off a remarkable season. And with the likes of Johns, Kane, Lyons, Mullan, Harkin and McGonigle still in their early 20’s, it could be the start of a very special period in the history of Coleraine FC.